This feature would allow players to send a notification alert to another player requesting they get on. We could have a /request [username] command. A player could type /request N104!!! 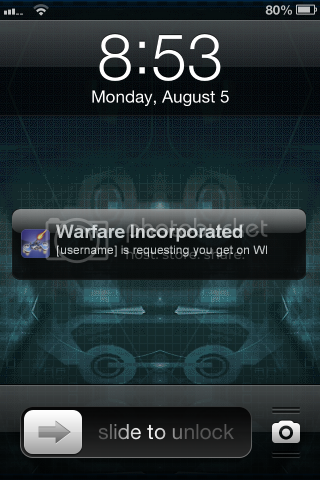 and it would send me a notification alert (see pic) saying they request me to get on. To avoid spam, a player can only send a request to the same user once every five minutes. To receive the alert, the account that the alert was sent to must be logged into your WI app. Only registered users would be allowed to use this command. For privacy, players can have three settings they can choose, No Requests, Selected Requests and All Requests. No one can send alert requests with this setting selected. If someone types your name with the request command, the server will tell the command issuer that you have request alerts turned off. No one can send you alert requests accept players who you allow. There will be a setting you can type in the account names of allowed users. If someone, who is not in your 'accepted list' types your name with the request command, the server will tell the command issuer that you have request alerts turned off. Anyone can send you alert requests. With this turned on you may get spammed a lot. To stop from being spammed, there will be a banned list which you can type the account name of users you do not want to be able to send you request alerts. The server will trace account's IP addresses so when you put an account on your banned list, it makes it so any account from that IP address cannot send you request alerts. If someone who is on your 'banned list' types your name with the request command, the server will tell the command issuer that you have request alerts turned off. Below I have a picture of what this feature would look like on the receiving end. Well another great idea! Would make it more fun for all!! Don't y'all think? I'd love this because I can on almost anytime (I'm at my house with WiFi 90% of the time and I'm normally doing something I can do and get on WI) but I don't hang out on WI all the time. If a player wants me or needs me they could use this to request me to get on. I'd get the alert and get on. I don't believe it would be very hard to add this idea. I've seen other games something like this. I thought of another idea for this. If you get an alert and can't get on, you would have the option to type a quick message to the player who sent it and tell them you can't get on right now. You could have custom messages to so you could just press a button and it would send them "I'm busy, be on an and hour".